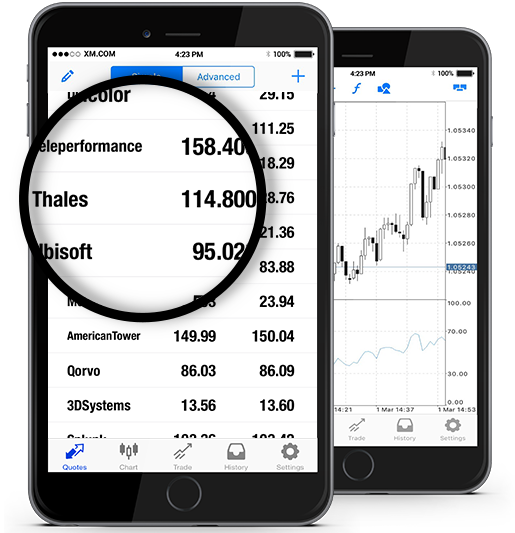 At XM we offer Thales S.A. (TCFP.PA) stocks as cash CFDs. Our cash CFDs stocks are undated transactions that aim to replicate the cash price of the underlying stock, and so they are adjusted for any relevant corporate actions. Thales S.A. (or Thales Group) is a France-based multinational corporation founded in 2000, specializing in the design and building of electrical systems (tactical radios, remote weapon systems, radar, infantry mobility vehicles, high-tech electronics) used in several industries, including aerospace, defense, security, and transportation. The company, which has operations in over 50 countries worldwide, is a CAC Next 20 stock market index component, and it is listed on Euronext. *** Note that the maximum trading volume for Thales per client is 141 lots. This limit will be reviewed on a daily basis and updated according to the value of the instrument. How to Start Trading Thales S.A. (TCFP.PA)? Double-click on Thales S.A. (TCFP.PA) from the “Market Watch” to open an order for this instrument.